Entering Saturday, Nick Leddy's Yahoo average draft position was 162.6 and his ownership was 16 percent. That'll change in a hurry. After being traded from the Chicago Blackhawks to the New York Islanders minutes after the Islanders acquired Johnny Boychuk from the Boston Bruins, Leddy becomes a favorite to earn top-unit power-play minutes for his new team. Considering that unit includes top-10 fantasy asset John Tavares along with Kyle Okposo, Mikhail Grabovski and Frans Nielsen, this is quite a development on the fantasy landscape. The 2014-15 NHL season is drawing closer by the day, so NHL.com has you covered with all the fantasy hockey advice you'll need come draft day. Leddy, 23, enters a situation where he'll be competing for time with injury-prone veteran Lubomir Visnovsky and young defensemen Calvin de Haan, Travis Hamonic and Griffin Reinhart (if he makes the team). This is a far more feasible task for Leddy than competing with Duncan Keith and Brent Seabrook for power-play time in Chicago. 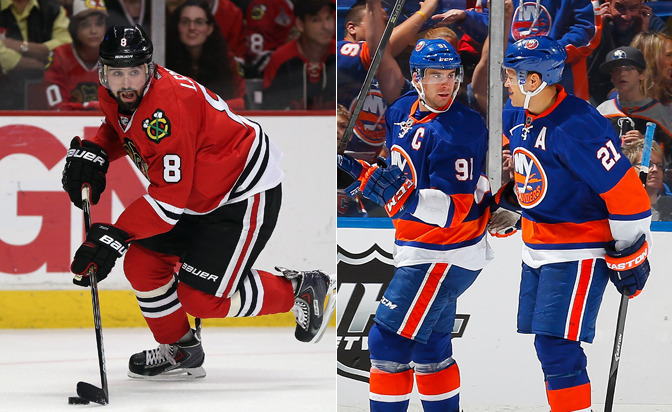 Leddy's potential was capped with the Blackhawks, which is why the fantasy world became impatient with his situation. But, after this trade, Leddy should be considered a top 40 fantasy defensemen with a ceiling higher than that. His time on ice per game (16:22 in 2013-14; 2:00 PP TOI per game) should increase significantly with his move to the Islanders, and the addition of Boychuk addresses New York's lack of size and toughness on the blue line. Leddy and Boychuk also should boost the value of goalie Jaroslav Halak, who should now be considered among the top 20 players at his position. Leddy has 29 power-play points over the past three seasons (212 games), has 20 career regular-season goals and had a 37-point season in 2011-12. Those numbers were solid based on his role with the Blackhawks, but his untapped potential is much more likely to be unlocked with this change of scenery. There are downsides to Leddy's value. His rating could take a hit leaving a perennial contender and joining a team that has missed the Stanley Cup Playoffs for most of the past decade. He doesn't produce penalty minutes, has a low career shots-on-goal average (1.24), and has fizzled in each of the past two postseasons. But if fantasy owners were content with drafting Leddy as a fourth or bench fantasy defenseman prior to the trade, there's all the more reason to invest in him now that he has a heightened role with one of the most-improved teams in the Eastern Conference. The chances of Leddy producing 40-plus points with 15 to 20 power-play points this season are very realistic, so make an effort to pick him up off the waiver wire before your competition does. If you haven't drafted yet, make sure to target him among the top 150 overall players and in the same range as defensemen Dion Phaneuf, Mark Streit and Brian Campbell. Leddy could end up being more valuable than many more proven players at his position and a big steal by season's end.